This plan of the city illustrates the government of London in allegorical vignettes. The vignette at top left depicts Liberty with Justice, Tranquillity and Rest (leaning against the elephant) and Patriotism (a young warrior). The vignette at top right depicts England between Commerce and Natural Justice. 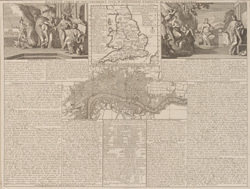 The drawing also features a small map of the territory of England. Accompanying text gives information on the London government and justice systems, with a small table illustrating Londoners’ yearly consumption of - among other things - beer (1,500,000 barrels) beef (67,500 animals) and mutton (675,000 animals).